Some of the team with Paul & Emma at some luxurious resort! On the last full day in Uganda, Nigel writes from Iganga: “I had another inspiring day with CFE where God moving in these vulnerable communities is evident at every turn. The day was split into three and began with a thrilling visit to a new CFE church plant about 45 minutes from Iganga at Lwerera. Next I had an opportunity to visit two families where a child in each family attends the Child Development Centre in Mawagala and the CFE school. Finally I visited a centre which is supported through the work of CFE by St James, it is called Nabikoote. The church plant at Lwerera is in a strong Muslim area but is flourishing. CFE has shown the love of God to this community and has among other things built dwellings for several very vulnerable individuals. The church now numbers 350 adults and 200 children. I will always cherish the welcome I received there. In Mawagala I visited one Moslem family and one Christian family. I have seen both families before over the period since August 2008 when CFE established 4 child development centres in partnership with Compassion International. The transformation in the children has been wonderful since CFE began caring for their physical and spiritual development. Finally I moved to Nabikoote where I heard how the lives of that community that was badly affected by HIV/ Aids has been transformed through the holistic work of CFE. Individuals in the community praised the work of God in their lives and the love shown by CFE supported by St James. They knew the names of several visitors from St James and were so encouraged that they are prayed for by our church. After a couple of false starts the "dear visitors" were called on at 1130. By this time Phil had cut 2 worship songs, the children's story and the Bible story from the St James contribution. Frank offered greetings from the people at St James and shared that people were worshipping at the 0900 service as we worshipped here at Kakira and were united in a common faith. I read the letter of greetings from St James that Martin sent and then we celebrated the huge hearts that Pastor Nicholas and Maria have for the children at Tumaini. The St James group ministered to the congregation in song (no dancing) with "Lord I lift your name on high" which we were relieved to find everyone knew. Phil preached on Nicodemus and the fried egg. Each phrase was translated, even though the message of Jesus calling Nicodemus by name and his personal transformation (raw egg to fried egg) was enthusiastically received by the English and Lugandan speakers. Phil led an informal and moving communion where the St James team served the congregation, all the Tumaini children took communion too. The service finished (1245) with a blessing and Pastor Nicholas praying over the St James team and offering thanks for the links between Tumaini and St James. The departure was difficult, hugs and hand holding from the Tumaini kids, letters to St James and a slow drive with much waving and shouting of greeting to everyone. We came back into Jinja to collect our bags and start the drive to Entebbe. As we got closer to Kampala the traffic got slower with trucks labouring up the hills in the city. Paul said it was a boarding school visiting day and that many parents were clogging the roads as they drove to out of town boarding schools. It took more than 4 hours to reach the Peniel Resort hotel, again worth comment on trip advisor, especially when we found we were 1 room short and 2 men had to share (but only pay $27 compared to $45). Phil and Christopher "manned up" and shared! The menu was limited for our last dinner and debrief, Chicken and Chips or Chicken or Chips. The group refuelled and there were some fantasies about a green salad and a glass of white wine, really really cold white wine. The group spent an hour or so on our debrief, reflecting on the trip, what surprised us, what we would take away and how individually we will respond to the experience of the Love Africa projects in Uganda this week. We reflected that we had experienced all aspects of the Love Africa projects, the single centre specific high engagement projects like Rahab and Tumaini and the PEP process in action at the community and individual level in Soroti, UWCM, ACET and CFE. We agreed that we had heard clearly stories of how Love Africa had impacted these people and communities. Everyone was so impressed with the knowledge and professionalism of Paul and Emma from ACET, we are privileged to have them as trusted partners for Love Africa. If you would like to hear more then please come to Annette's Thursday evening or Friday morning session when a couple of people at each event will speak about their experiences. We agreed to finish the trip tonight and say our thanks and good byes as we will be in different seats on the plane tomorrow and will want to collect bags and meet family as quickly as possible. Thanks to everyone who has followed, supported and prayed for the trip. Your support has been appreciated by all of us. If you would like to experience an exposure visit there will be another visit in 2014. Early start tomorrow for the flight back. Nearing the end but still plenty to do! 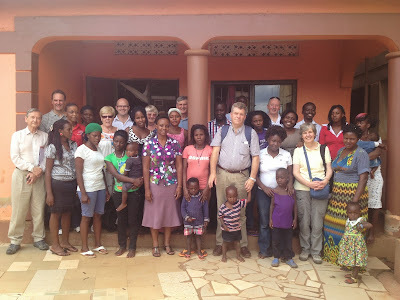 First, Nigel reports from Iganga where he is staying with Pastor Paul: “It was a great day that included a meeting with Pastor Paul and his senior management team in the morning followed by visits in the afternoon to two of the eight CFE centres / churches supported by St James, Kiroba and Nakabugu. The morning meeting was spent discussing the St James supported project and some of the key developments in CFE's work including the growth in micro finance to promote income generation. Microfinanance plays a key role in mobilising seed money for income generation activities. 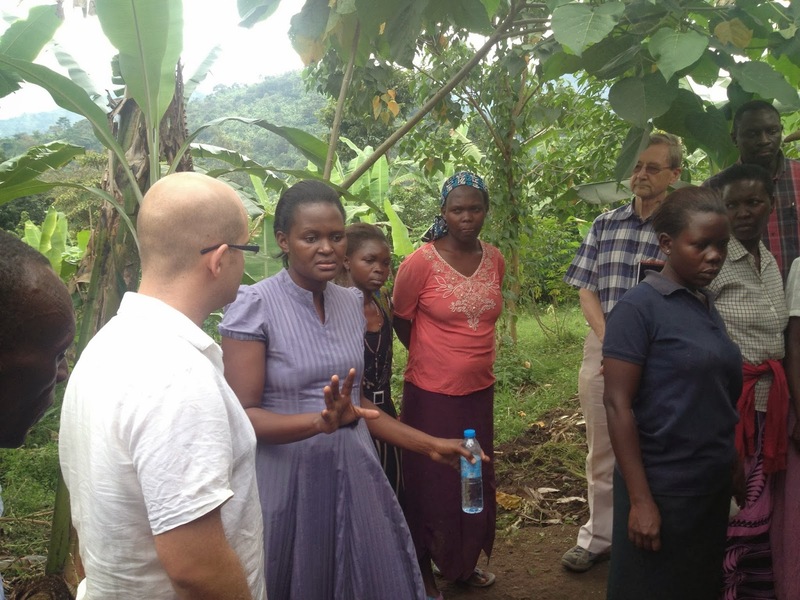 The growth of savings and loan schemes in village communities in Uganda has been very significant in the last two years. The visits to the two centres were inspirational as we received numerous testimonies of how the holistic work of CFE, supported by St James was changing lives and building faith. Countless individuals sent greetings to St James and emphasised the importance they attach to the St James relationship both financially and through prayer. Frank writes: “Today is the first of 2 days at Tumaini Childrens Home, which creates such polarised feelings in Love Africa, and the Kakira Christian Centre where we will attend the morning service tomorrow, Sunday. We drove through Jinja and then the Madvanhi compound to Kakira village and the Tumaini Children's Home with big expectations for the day. We were welcomed by the children singing greetings to the "dear visitors" and Pastor Nicholas (PN) and Maria. Amazingly the programme that we planned was pretty much implemented. The children sang songs of welcome with rhythm and harmony and with PN's support turned over the to "dear visitors" and introductions. While the last minute preparations were completed we went on a "Lion Hunt" with the younger children and then launched into the play we prepared of the prodigal son with simultaneous translation (which slowed some of the drama slightly) and a series of choruses led by Phil and Frank. Spent, we passed back to the children who sang, presented Bible memory verses, danced extravagantly and 4 kids gave moving testimonies of how God had provided (!) in their lives and blessed them as orphans. Tough stuff to listen to. The visitors responded with a Bible verse for St James. You may remember that Martin quoted Isaiah 43, 19 "See, I am doing a new thing! Now it springs up; do you not perceive it?" at ProVision Sunday 2012 (and reminded us of the verse last week). During the May 2012 visit of the Love Africa Steering Group Martin met with one of the Tumaini kids Richard who had quoted this verse to him and Martin was inspired in his vision casting. We told the Tumaini kids this story with Richard out the front and they were wild that this message from one of their group could have been carried back to GX and influenced our whole fellowship. (Phil later videoed Richard speaking this verse and giving us a "word" for St James on how God spoke to him). The morning session concluded with Pastor Phil offering a blessing to the 4 kids whose testimonies we shared, Barbara, Doris, Annette and Richard and for all the Tumaini kids. Before lunch the entire team had the time to meet in small groups with the Tumaini children and share life and faith stories. Everyone was overwhelmed at the openness and affection of these children as they gathered in groups of 2-10 to chat and share their stories and ambitions. 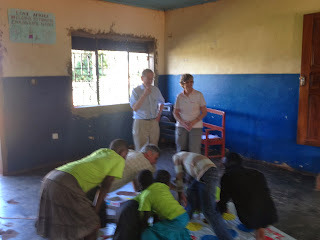 The group took a break at lunch time to set up for an afternoon of games with the kids, twister(apply for photographic evidence), paper plane making, card making, ball games, cutting and sticking and culminating in the tennis game Kevin had prepared for the kids (hence the 75 pairs of ladies tights) which all 57 kids took part in and enjoyed with unrestrained enthusiasm. It was a fantastic finale to a long day where the team from St James engaged with the kids in a loving, affectionate, unconstrained environment where we shared God's love for the kids and their deep faith in Jesus Christ. 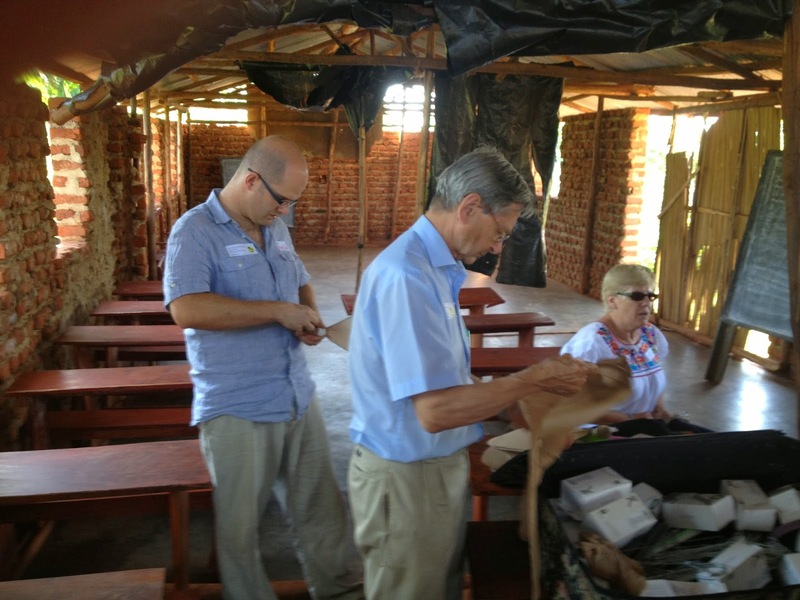 During the last hour Phil and Frank met privately with Pastor Nicholas and Maria to think about the immediate future of Tumaini and how they can interact with Love Africa. Tumaini faces some severe challenges going forward concerning food security, education, buildings and transitions of the older kids into tertiary education and work (there are a number of very high achieving and ambitious kids in Tumaini). Maria, PN's wife has been sick recently so we had the chance to pray with her and for PN's ministry. As we were preparing to leave after 6pm Phil and I asked innocently if we were expected to take part in the Kakira Christian Centre Service tomorrow, "Oh yes said PN, only for an hour and a half of praise and teaching the Word, and could we also lead communion and by the way Kakira Christian Centre had no bread or wine to celebrate communion, could we provide this too!" Pastor Phil paled a bit but remained calm and restrained at the prospect of preaching for an hour through a translator. It was a weary group who returned to "Paradise" at 7pm after 9 hours at Tumaini with the prospect of leading worship and communion for 160 people tomorrow morning. Restored with a Nile special and chicken in a basket we were ready to take on the challenge to represent St James tomorrow at Tumaini. It was a wonderful day which again brought out the essential contradictions in Tumaini which we struggle with, on the one hand we support PN and Maria's huge hearts to care for 57-72 "orphans" who are educated, healthy and growing spiritually and on the other, the lack of insight and planning PN shows in leading Tumaini as his vision is inconsistent with surviving the short term. 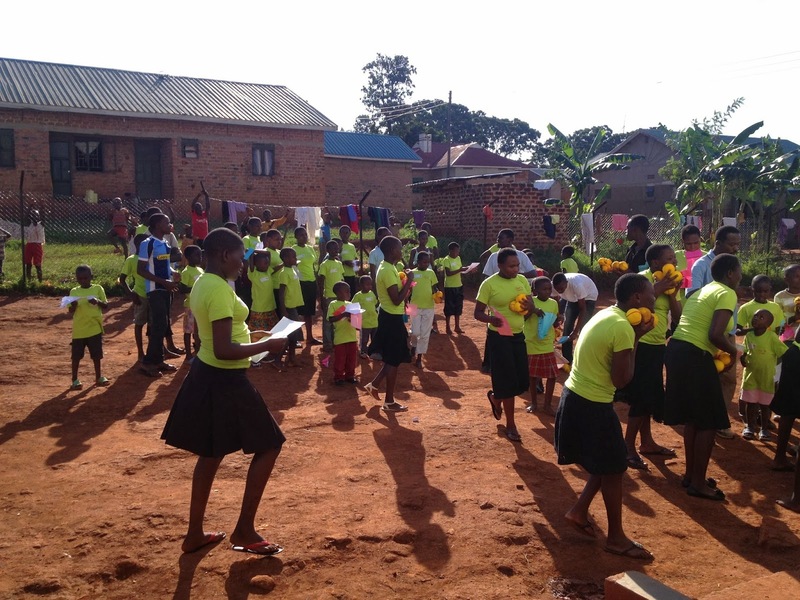 We are looking forward to meeting the Kakira Church tomorrow and worshipping with the children before we set off to Entebbe and our last night and debrief before the flight home on Monday. If you want to hear the latest we hope Phil will Skype in to Nexus tomorrow night. Frank begins “The 4th day is tough, the adrenaline rush of being in Uganda is wearing off, the physical nature of the travel and the emotional engagement takes its toll. The day didn't start well at the "Desert Island Resort". Breakfast was not ready at 7.30AM as ordered, in fact there were only 5 slices of bread among 9 of us, yesterday’s sausages and cold beans. I feel a post on Trip Advisor coming on. The one member of staff who had not disappeared assured us that "the staff has gone to the shops to get her" which by 8.25 turned out to be eggs, turned into an omelette and another slice of bread. We had allocated the groups the night before to UWCM, led by "Nigel", Angela and John, Noelle and Sheila, and to ACET Mbale Christopher, Kevin, Pastor Phil and Frank and travelled in our groups to Mbale. We were able to check in at the Mt Elgon where the team were fascinated by the Ikea furniture in the bedrooms, working showers and loos and internet. The helpful staff were able to pick up on the laundry where the Desert Island had left off, that is the Desert Island staff had for some reason washed our clothes but delivered them wet back to our rooms. Now all thankfully resolved. Angela wrote: “We went to the offices of UWCM and received a very warm welcome from Edith Wakumire and her team. We met a team from Bristol who were on their exploratory trip to the UWCM. We were given a presentation and then went to visit two examples of the CMT programme. William was in charge of the office in the village where they were hiring out plastic chairs to raise funds for the community. We went to see a young woman, who had been orphaned in 2004. She had been supported by the village CMT project and had trained as a hairdresser. She was now running her own hairdressers in the village. We then moved on to visit a lady who had lost her home, her husband and two children in the landslides. The UWCM had supported her by helping her to buy a plot of land and the community had helped her to build a house. This visit was very moving. The house was immaculate. The walls were wallpapered with newspaper. The garden was full of vegetables she had grown and in a pen was a calf. She had looked after a cow and when it had its calf, she was able to keep the calf. She had had ten children and was now looking after eight children, including her nephew. We prayed with this lady as she has a health issue. She was an inspiration to us. We then returned to the UWCM offices for a lovely lunch. In the afternoon we went to visit a village community which was fully embracing the CMT project. We watched a very moving drama and shared Bible passages. We were privileged to be part of the presentation of gifts to the needy members of the community - including mattresses, cooking utensils and school writing books. We also heard about the savings scheme enabling the purchase of animals, etc and 60% of the interest charged is given back to the community particularly to support those living with HIV and AIDS. We then went to visit a grandmother who had just been widowed. This was a very moving visit. The UWCM had supported the grandmother in her claims to a very small house. It had no garden and her daughter and granddaughters were living with her. We prayed with her and left feeling very sad that we were leaving this grieving woman in this state of poverty. We were just pleased that at least she had the roof over her head. Then, off to the field. We drove for an hour or so out of Mbale into the foothills of Mt Elgon to a village called Bukabombwe where ACET has been active in a Church mobilisation project in a very small multi denominational community. ACET had run a PEP type process in the community based in the local Catholic Church. Out of this the community had defined various high priority areas for community action and income generation. ACET had seeded a pig project with the gift of 2 piglets. The deal is that the recipient of the piglets must give 2 of the litter to a neighbour to start their own pig project. From the original 2 piglets the community is now on the 4th generation and over 40 families have benefited. One family we visited had sold pigs and bought 2 cows. Though this was a small community compared to Soroti the welcome was equally warm with speeches and an amazing couple of songs from an elderly lady in English then in the local language. The community Chair (Rose) was a wonderful sales person and we were persuaded to buy beads (only 2 pairs), baskets for the ACET ladies for Janet's proposed wedding and an enormous quantity of liquid soap and hair wash which the community produces which we will donate to Tumaini. Again for the 4 of us the welcome and acceptance was humbling. The work of ACET using the PEP process showing the Biblical basis for community action is impressive and we felt blessed to share in it. We were offered "refreshments" boiled eggs and bananas ( spot on for the travellers) and deep fried liver from an unidentified animal (thanks to the ACET staff for eating this) to energise us to walk round the hilly village to inspect pigs, cattle and coffee plants. Phil was persuaded to play football with some of the local youth (as the youngest visitor) and then we were off down the mountain before dark, having to refuse dinner from the community. Edith and Janet from UWCM were waiting for us at the hotel when we returned and ominously Edith told me she wanted to speak to me! We had a great time of fellowship over dinner for 15 (which taxed the Mt Elgon staff) with UWCM staff and ACET guys and Naomi. Naomi brought her 2 delightful daughters to meet us before dinner. I sat down with Edith and Anastasia (Nasta) after dinner. Nasta has some great experience of leadership in the NGO field and turns out lives only 2 miles from the UWCM compound. She seems engaged and confident, Edith seems pleased and relieved to have found a new Director and we must hope and pray this is the right person. Edith wanted me to communicate to the people of St James including Pastor Martini her appreciation for the support from St James, the faithful prayers and relentless interest and visiting which she appreciates so much, her message, please keep doing it! 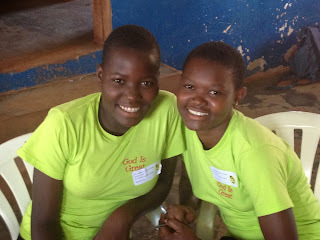 By the time I was finished with Edith the weary travellers had gone to bed, exhilarated and exhausted again from the emotion of seeing Gods love through Love Africa played out in the lives of people at an individual level, somewhat differently from yesterday’s community experiences at PAG Soroti. The team on the exposure visit have had a wonderful, inspiring day and we are in awe at the way God has worked through PAG Soroti in the communities we visited today. We met initially in the PAG offices. Unfortunately Bishop Francis had a funeral to take today and was not able to be with us but came and met with us in the morning to apologise and ask us to visit again and maybe spend more time with him and the PAG team on training and ministry. Sadly also Simon the General Manager was ill and we didn't meet him. We were hosted by Sam the new Monitoring and Evaluation Officer, Pastor Patrick, who we have met before, Deena the finance officer and Filo(mene) the new Health Programme Officer. They provided a great welcome and a fantastic summary of the PEP (participatory evaluation process) that was piloted in PAG Soroti and has now been implemented in 946 communities in the Soroti region. We had a well thought through programme to visit 3 new communities including Kadungulu which Love Africa has supported in the current funding round, which was completed only 4 hours behind schedule by 7.45pm tonight! The first visit was to Iruko okulukulun community. The welcome from the people was overwhelming in its extravagance with unconstrained singing, dancing and ululating (!) in their excitement at a visit from a group of white people for the first time. 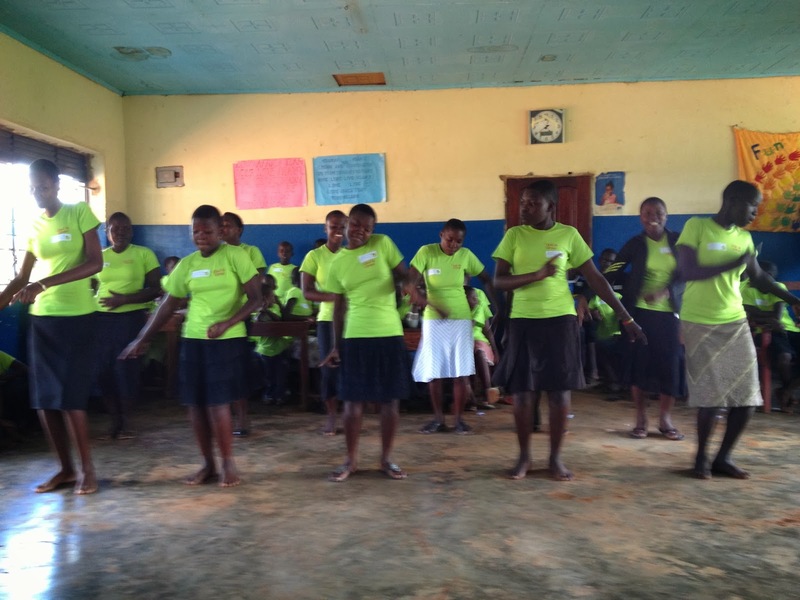 After the group introduced themselves we heard reports and testimonies of the impact of the PEP process on the community, how attitudes, individuals and the entire community had been transformed The people came from PAG, the Anglican Church of Uganda and the Catholic Church. They had worked to together on a "people living with HIV" (PLWHIV) support group and moved beyond the success of the PEP process to set up a savings and loan scheme for the community to allow funding of new projects, school fees etc. The people demanded a "word of encouragement from your leader" (Hebrews 4.12) and a blessing from the real theological Pastor (Phil) and thanked us for the encouragement they had received from the people who cared for them so much in the Lord to travel to their village to meet them. The whole experience was overwhelming for the group in the outpouring of emotion, the exuberance of the dancing, the response of the people to what we shared and their testimonies. We left with great difficulty when we had to say good bye and shake hands with almost everyone in the village and by promising we would visit again! We travelled on to the village of Kagawara on the lake, a main landing site for the fishermen. We were welcomed by a smaller group, with less exuberance but equal sincerity at their pleasure of the visit. The presentations were more formal from the Chairs of various political and Church sub groups, again cross denominational (could we learn something?) These people too testified to the power of the PEP process in transforming individual lives and the community. They were anxious to have an open Q&A session and again several couples were keen to be identified as being PLWHIV. This group too wanted a word from our leader (John 3,16) and a blessing from the Pastor. We were taken to the lake to inspect the boats and the landing place and then as we were ready to leave at 4.30pm they sprung on us an invitation to a "late lunch". Not to offend we ate quickly and sparingly and set off for the Kadungula community. This is a community where Love Africa has supported a PEP process over the last 2 years with amazing impact. Though the people were lower key than Iruko they were engaged and anxious to shares their stories of the impact of the PEP process, how their studies of the Bible illustrating the Church as salt and light, stories of resource mobilisation and relationship building has impacted their community and driven change. They have set up 2 finance schemes supporting youth (up to 35) and adults which have been used to e.g. finance buying timber for a carpenter to make beds, to fund school fees and scholastic materials in the short term. The confidence and pride that these people showed in their faith in action was an inspiration to us all. We had to leave quickly as it was dark and the 30 minutes journey along bumpy unmade roads seemed to take 90 minutes in the dark. When we arrived even the Desert Resort seemed welcoming. People were exhausted from the travelling and the emotions of a day where we were really confronted by the power of Love Africa releasing this latent power of the local Church. We as a Church should rejoice at the privilege of being involved in Love Africa and the impact on people’s lives that has been achieved through God's use of the PEP process. The team are out of internet connection tonight so I had a quick call from Frank with the following update. They arrived safely in Soroti (NE Uganda) this evening at 5pm after an 9 hour drive on bumpy, pot-holed roads so they are pretty exhausted. On the way, they stopped briefly at the Tumaini Children’s Home, met Pastor Nicholas and dropped off the bags of clothes donated by St James families. Once at the hotel in Soroti (not a 5* hotel! ), they had a visit from Bishop Francis of PAG Soroti and then the team had dinner together. They are looking forward to meeting the staff of PAG Soroti tomorrow and seeing some of their amazing work first hand. Please pray for health & strength for the team – the trip today is the longest they will be making over the week – and that they will be both encouraged & be an encouragement to the people they meet tomorrow. “The travellers arrived weary from the long flight in Entebbe this morning at 7.30, passed through immigration uneventfully (with the exception of the 1 person who was organised to have arranged visa before arriving), collected our 27 checked bags and spooked Paul and Emma with the amount of luggage. For most people the drive from Entebbe along the lake to Kampala was the first experience of Uganda, the traffic, vegetation, red earth and the people. We were allowed a brief turn around at the American Club while Paul and Emma and Clare sorted the bags and then we were off. The plans for today had changed, and they were much better. All 9 of us went directly to the Rahab drop in centre to meet Annette, her staff and about 10 of the regular girls and their children. After introductions the group broke up into little groups of team members and the girls and children to look at pictures and hear about each others lives. Annette reflected on the transformation in the behaviour of the girls through the work at the Rahab drop in centre, where shown God's love in action they respond and become different people. It was great to see everyone throw themselves immediately into the trip and engage with the girls. The group were very enthusiastic about Annette's visit and her presentations the 10th and 11th October. She gave us a brief preview of what she will say. Please recommend these sessions to your friends, I think it will be most inspiring. Next on to Kiswa the partner school to the Gerrards Cross C of E school. We were shown in to Pastor Wilson office for a briefing and to allow us to pass on the letters and CDs that Nicola had sent. We also gave the school the "run the race t shirts" and some scholastic materials from the supplies. Just as the rain started we were led across to the school by 2 girls spreading rose petals on the ground for us to walk on. The welcome to the "dear visitors" from the school choir was extravagant. We were introduced to the prefects, staff, music director and the (fearsome) headmistress. The visitors were then called on to respond by introducing themselves, quickly learning that the response to "Praise the Lord!" is an enthusiastic "AMEN!" We were able to teach the kids the actions to "God is good to me," they were quick learners. The rain fell throughout the performance, heavier and heavier with the sound on the tin roof deafening, making it difficult to hear the kids and then suddenly there was a flood of red muddy water coursing across the school floor so we all had to lift our feet and bags off the ground to keep dry. For the finale the Kiswa kids sang and danced an energetic song which culminated in them rushing off the stage to grab the "dear visitors" to join in. Fortunately no one was free to photograph this particular spectacle but the Kiswa kids clapped enthusiastically. The exuberance these kids show for the gospel in songs and dancing is exhilarating. The leaving was emotional, we were blessed by Pastor Wilson and led out to the ACET vans through throngs of enthusiastic kids who wanted to shake hands and high five. The weary group then split, Phil and I went to the PAG offices to meet with Bishop Simon Peter's representative (long story but we never met anyone) while the others changed money and returned exhausted to the American Club for an early dinner and unwinding from the hectic first day. Tomorrow is a travel day all the way to Soroti, maybe 5 hours, maybe 8 hours or more driving. It has been a great introduction to Uganda and Love Africa for everyone.